Patrick Hruby: Newt: Too Big to Not Fail? Will anti-fat bias affect the 2012 election? As if Newt Gingrich doesn’t have enough problems after his disappointing fourth-place finish in the Iowa caucuses under a barrage of blistering attack ads, here’s one more to consider: his weight. Compared to his primary rivals, the erstwhile Republican front-runner is, well, pudgy. 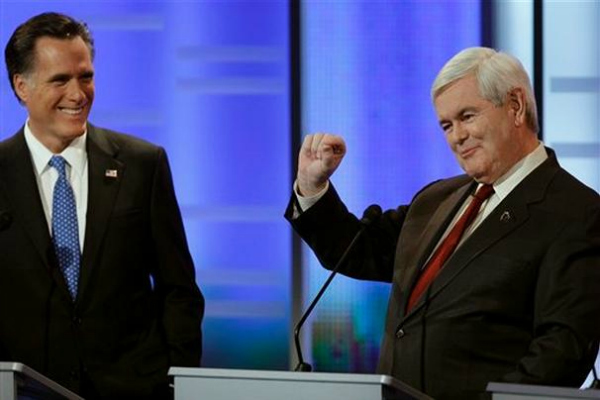 If Mitt Romney is a human Ken doll, then Mr. Gingrich is more of a mini-Stay Puff marshmallow man. And in an image-conscious, fat-obsessed nation that hasn’t elected a truly hefty commander-in-chief since President William Howard Taft in 1909, that may be a serious — and seriously underappreciated — political liability. Call it unfair, call it shallow — but according to obesity experts and a preponderance of sociological research, a powerful current of anti-fat bias runs through American life, influencing everything from cultural attitudes to workplace outcomes. The ballot box is no exception: Heavyset candidates face a battle of the bulge. Once upon a time - specifically, before the advent of television, late-night talk show monologues, P90X and “The Biggest Loser” — weight had minimal bearing on politics. Mr. Taft and his size 54 waist could win the White House and subsequently install an extra-large bathtub in the White House to little fanfare; 260-pound President Grover Cleveland could shrug off a tactless visitor remarking, “Well, you’re a whopper!” without enduring a heaping helping of public scorn. Impolitic as she was, the daytime gabstress was hardly alone in her sentiment: Dozens of pundits and news articles questioned Mr. Christie’s literal fitness for office, as did a broadcast segment on ABC News. Think of the presidential campaign as the longest, most public job interview in the world. Now consider: According to obesity specialist Rebecca Puhl, several decades of sociological research indicates that obese job applicants are less likely to be hired and more likely to receive lower starting salaries than thinner applicants, particularly for positions that require frequent contact with the public. On the job, obese individuals are more likely to be fired, less likely to be promoted, and suffer a weight-related wage penalty. A National Longitudinal Survey of Youth found that obese men earn up to 3.4 percent less than their more svelte peers, obese women earn up to 6.1 percent less, and severely obese white males earn as much as 19.6 percent less than their normal weight white counterparts. In a relatively common experiment, Ms. Puhl said, human resources professionals are asked to evaluate a series of job candidate applications. The applications are identical, except for one detail. “Only body weight is different,” said Ms. Puhl, a research director at Yale University's Rudd Center for Food Policy and Obesity. “Obese applicants are perceived to be a poor fit for the position they’re applying for, even when they have better qualifications than a thin person. Employers would actually prefer to hire a thinner, less-qualified person. According to Ms. Puhl, national surveys have found that when Americans are asked if they have experienced discrimination because of a range of personal characteristics — including gender, age, race and sexual orientation — weight-related bias is the fourth most common form of discrimination reported by men and the third most common by women — more common for females than racial discrimination. Other studies have determined that overweight individuals receive worse treatment from health care facilities, educational institutions and even the media, where obese people remain popular and accepted targets of ridicule and have been held partially responsible for causing weight gain in their friends, rising fuel prices and even climate change. According to Ms. Puhl, obese individuals suffer from negative stereotyping and are believed to be lazy, unmotivated, sloppy, dumb, dishonest and lacking in both willpower and self-discipline — hardly the sort of traits politicians want on their campaign bumper stickers. Many of the stereotypes “are rooted in the belief that people are solely responsible for their body weight,” she said. “We blame the individual, and don’t recognize that obesity is much more complex, involving genetics, biology and societal and environmental factors. For political candidates, the upshot would seem clear: The bigger the belt size, the smaller the prospects of electoral victory. In a 2009 poll of likely New Jersey voters, 19 percent said they were less likely to vote for Mr. Christie because of his weight. Similarly, a 2009 study of 50 state governors by political analyst Nate Silver found that 10 were overweight and only three were “clearly obese” — a tellingly low percentage, given that the federal government reports that two-thirds of American adults are overweight, with one-third qualifying as obese. The joke, of course, was that Mr. Barbour was only half-kidding. They can, of course, and do. And, as we shall see, they often expect the contrary as well. The visual contrast in the 2009 New Jersey gubernatorial race couldn’t have been more stark: In one corner, Democratic incumbent and running enthusiast Jon Corzine, the picture of middle-aged physical fitness; in the other, decided running non-enthusiast Mr. Christie, a man whose girth resembles that of a professional football lineman — before the start of training camp. In a televised attack ad, Mr. Corzine’s campaign attempted to capitalize on the difference, showing slow-motion footage of a jiggling, jowly Mr. Christie emerging from a sport utility vehicle while accusing the Republican challenger of “throwing his weight around” to beat traffic tickets. Playing to negative stereotypes? Check. Lack of subtlety? Double-check. The spot backfired, as Mr. Christie won widespread plaudits for playfully joking about his weight with radio host Don Imus — Imus: How much do you weigh? Christie: 550 pounds — while an embarrassed Mr. Corzine distanced himself from weight-related political attacks during a CNN interview. “Fatness is a slippery and relative concept,” cautioned University of Colorado law professor and cultural commentator Paul Campos. “Especially with men. We want men to be strong and associate strength with size. In a 2010 University of Missouri study, 120 student volunteers were split into two groups and shown pictures of fictional male and female political candidates, along with written descriptions of their background and views. The first group was shown undistorted photographs; the second was shown photos that had been digitally altered to make the candidates appear overweight. While the students viewed the obese female candidates more negatively than their non-doctored doppelgangers, they had the opposite reaction to the heavyset males — judging them more honest, reliable, inspirational and capable. Elizabeth Miller, a University of Missouri political scientist and co-author of the study, said that while she was unable to discern why the obese male candidates were more appealing, she suspected that the altered images may have conveyed additional muscle mass as opposed to additional fat. Perhaps shrewdly, then, a handful of candidates recently have tried to make their opponent’s thinness a liability. In 2008, Sen. John McCain’s campaign attacked Mr. Obama for going to the gym three times in one day, claiming that “only celebrities” — read: bad people not like you — do such a thing. The Sunday Times of London posited a link between Mr. Obama publicly declining a slice of cake and losing the Pennsylvania primary. By contrast, footage of Bill Clinton jogging into a Little Rock, Ark., McDonald’s before the 1992 presidential campaign was widely credited with helping him connect with the public. The reason? Though voters want politicians to be inspirational figures, they also want them to be relatable, sharing the same appetites and foibles. After all, Mr. Campos said, ours is an era in which obesity has become both a public health and civil liberties lightning rod, from New York City’s 2006 ban on trans fats in restaurant foodto proposed taxes on sugary sodas in Virginia, Michigan and California. Mr. Campos sees an opportunity for Mr. Gingrich to perform political jujitsu, to use his weight — literally — to flip an opponent. “To the extent that Gingrich’s weight becomes a campaign issue, it might well serve him to use it as a humanizing characteristic, especially next to his sort of Ken doll opponents,” he said.